- Frosty mornings. I don't like being cold, but the frost over the garden in the mornings is so pretty. - New make-up. Ian got me an amazing new foundation and concealer from Bobbi Brown for Christmas, but I have only recently started to use them. The foundation makes my skin look so luminescent and flawless without looking heavy. It is my new favourite, I love it even more than the Chanel Vitalumiere that I usually rave about! On Saturday I bought myself a new eyebrow pomade from Freedom, it's only £5 and it is fabulous! You can get the foundation here*, the concealer here* and the eyebrow pomade here*. - Little N being chosen to show the other children what to do at football class. He has been going to his football classes since he was about 18 months old, and Ian tells me that he usually messes about. So it was amazing to hear how well he did and that he was picked out by the coach! - Lunch with Ian and the boys at Starbucks on Sunday. We make an effort to go out somewhere each Sunday. Sometimes it's somewhere "proper" and sometimes it's simply a coffee shop. I love our Sundays. - My first parents evening at Little N's preschool. It was his settling in review on Wednesday evening. I got to look at his learning journal which has photos from his first day, and more photos and descriptions from his time there so far. His keyworker said he has settled in so well and he looked so happy in the pictures. - Having Ian home, he had been to Amsterdam for a client meeting. It was just one day and night, but it's still good to have him back! - Messy play with Baby J. He still isn't used to going to toddler groups without his big brother, but we tried a messy play group yesterday and he had a lot of fun. He enjoyed playing with the sand pit, splashing the water, painting my arm (! ), and he really loved the songs at the end. - Spending time with my little brother. My little brother is actually 30 this year, so not so little! I don't see him often, but yesterday he had the day off work so came over to visit. We went out for lunch, had a coffee and a mooch about the shops, and did a lot of talking! - Daffodils. 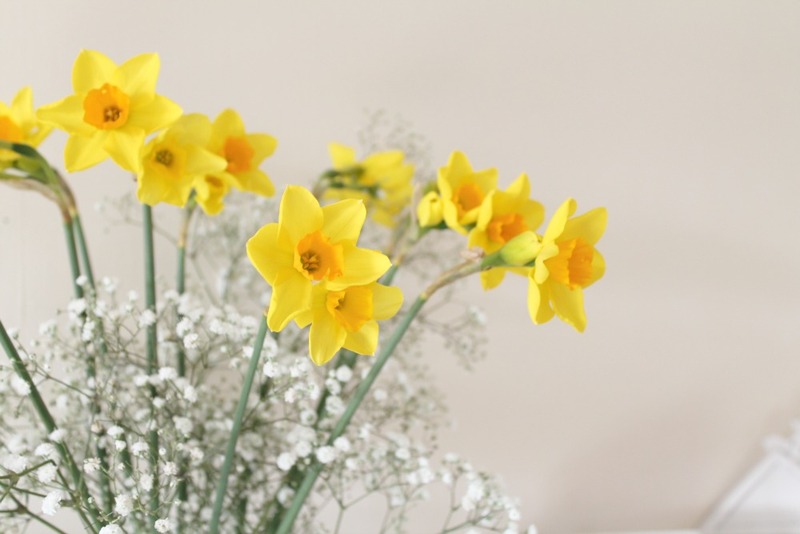 The daffodils that I bought last week have been smelling amazing all week, I must find out what type they are as I have never known daffodils to smell so beautiful. They are past their best now, so I bought two bunches of standard daffodils today. They are just so bright and cheerful, I can't wait for the buds to bloom! We try and do a 'family day' every Sunday as well, it's so nice to have that time all together. Your daffs sound lovely - I'm a big fan of daffodils at this time of year too - such a cheap way to brighten up the house! Glad Baby J enjoyed the messy play - my little one has never been a fan, though is gradually warming up to it these days. I dream of the day we can get the paints out and make a big mess!! I must go buy me some daffs! I keep holding out for someone to buy me flowers but I always wait a long time!